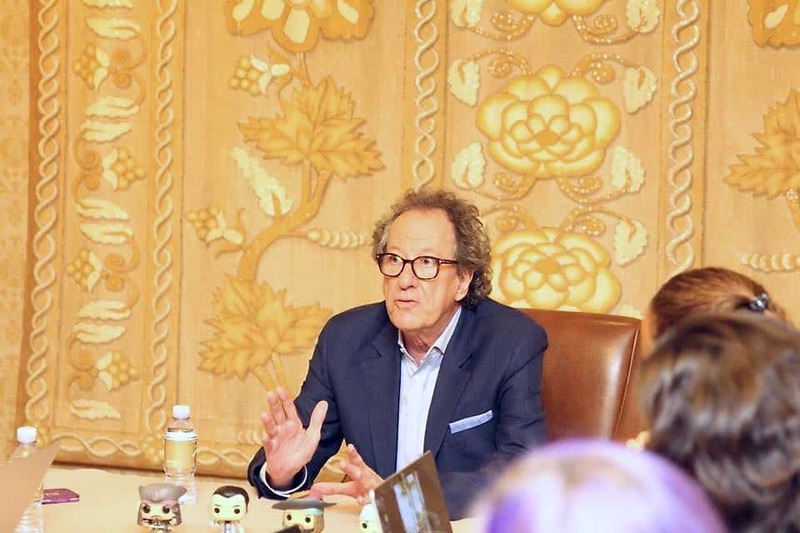 Sitting down for an exclusive interview with Captain Barbossa, Geoffrey Rush was just amazing. I have always been a fan of his and the diversity and complexity of his roles. 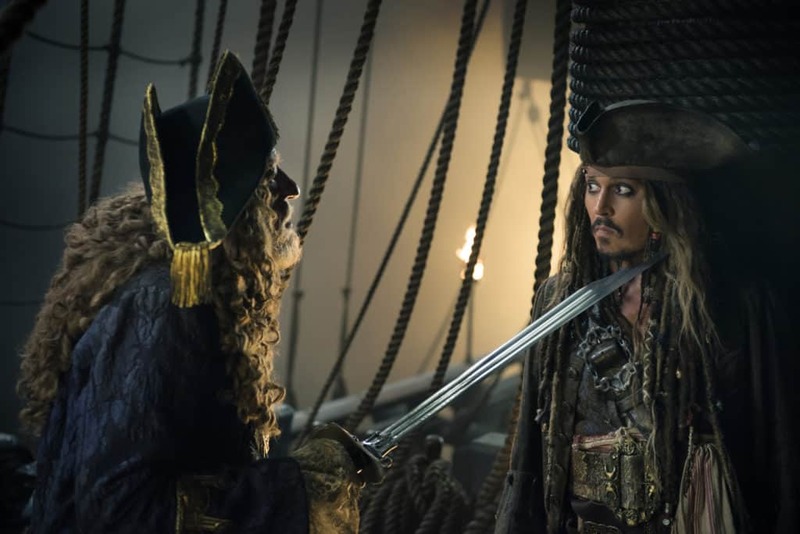 It’s a mark of a great actor when they can play characters like Albert Einstein and Captain Hector Barbossa and you never once sit and think, hmm that Albert is a little too Piratey for me. Year made: Sitting next to Geoffrey! He joked that IF there was another Pirates film Barbossa should settle down with a Mommy Blogger! We all laughed. I seriously could listen to his stories all day. He didn’t just answer our questions with a quick blurb. No, he took us on a journey through the entire Pirates franchise in a way only the great Geoffrey Rush could. It’s hard to believe that the phenomenon of Pirates began in 2003. Going back to the beginning, what was the inspiration for these characters? Johnny was the king of the independent film scene. For him to create such a unique, unpredictable pirate, there is nothing like it in literature or cinema. The back and forth between Hector and Jack has always been hilarious. It’s a lot like two siblings. The eye rolls, the one-ups, the fighting. It’s like watching my kids! Barbossa has come a long way since Curse of the Black Pearl. He was a mutinous, devil of a (undead) man when we first met him. Then he died, was brought back, and even worked for the King for a bit. Geoffrey describes the arc of Barbossa from the first film to Dead Men Tell No Tales. Before I actually entered into the story, he was described rather fearfully. He was spat out of the mouth of hell. To me that was the key line. I thought whenever I enter into this story if you don’t see that then he is liar. He was pretty much the dark villain. And he had to break the curse. Which I think I then enjoyed having all my senses back, for about 30 seconds and then I got shot. (Laughter) Poignant but rather a ridiculous comic moment. And I thought that was fun. When he found out he was coming back at the very end of the second film. Okay, he’s alive. Now what will he do? I sorta became a politician. I was the guy getting the global Pirate G20 meeting together. And that was fun to play, because he’s a control freak. He loves thinking he is the most powerful person on the planet. When he read the script for Dead Men Tell No Tales, he loved that Barbossa had become so wealthy. I like that it brought out the vulgarity. Barbossa isn’t somebody with any sense of personal style whatsoever. He wouldn’t care if he mixed checks with stripes. Lets talk about the one relationship in the Pirates films we all love: Barbossa and his monkey, Jack. After 5 years, Geoffrey didn’t think the monkey would recognize him. Pablo even gave Geoffrey a wrap gift. A personal painting, signed by Pablo. So sweet! Pirates of the Caribbean: Dead Men Tell No Tales is now in theaters! 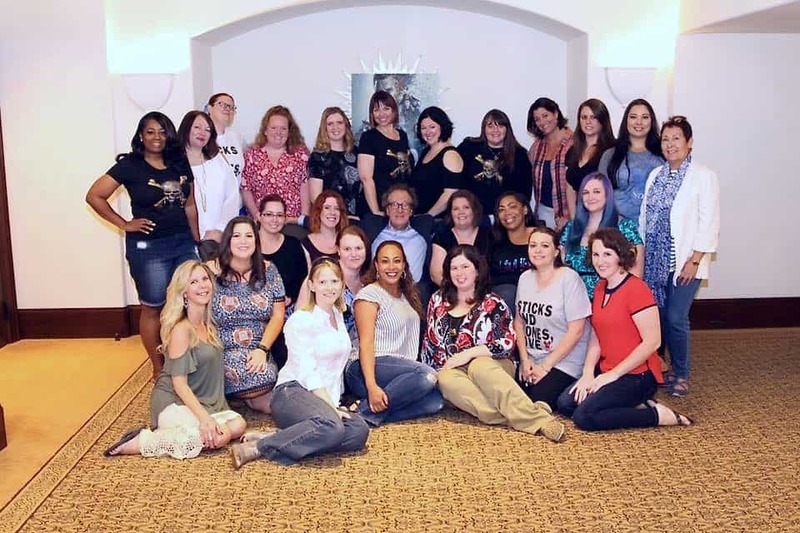 Previous Post: « Interview with Captain Salazar Himself, Javier Bardem! So fun! What a great interview! I could listen to him talk all day. What a great opportunity to interview him! I’m a big fan and crazy excited to see the new movie. 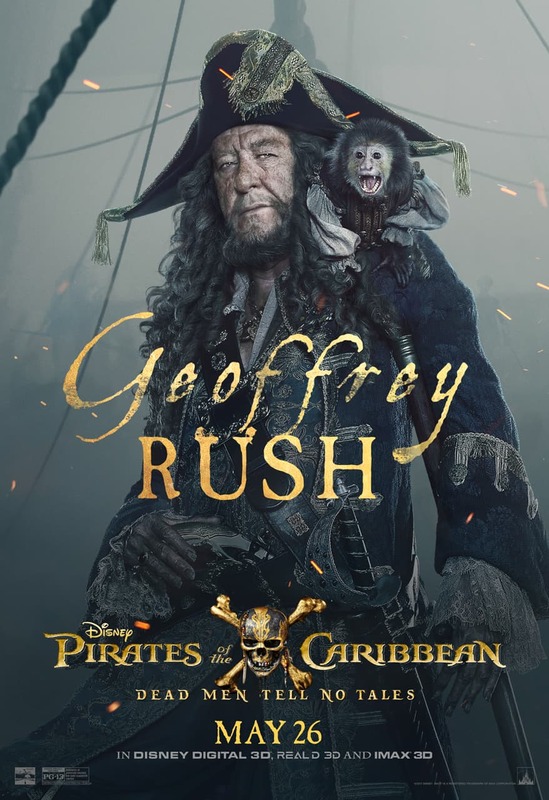 I am a huge fan of Geoffery Rush. His work is so good all the time. He is also a perfect person to play Captain Barbossa. I love this man dearly. Barbossa has always been a scene stealer in this series. 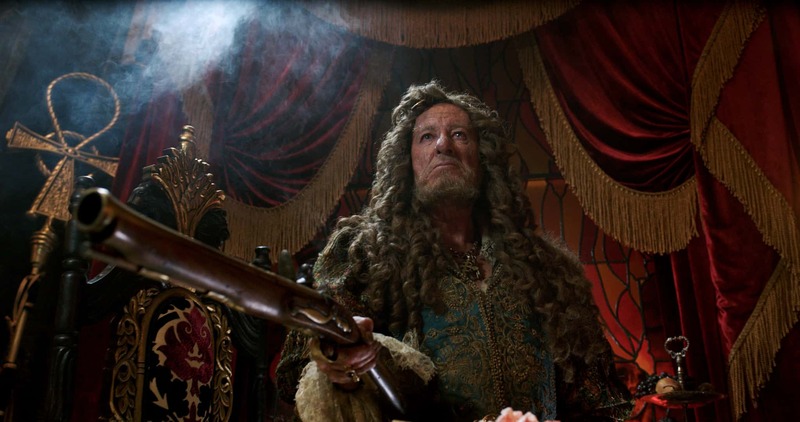 I’m glad Geoffrey Rush got the role because there really is no other character like Barbossa! How cool! He is such an amazing actor. I’d love to meet him one day. I would have died if I got to interview Geoffrey too! This sounds like an incredible experience. What a great interview. I’m glad you were able to do such a nice job! Look, y’all look to happy LOL Thanks for sharing this interview with us. 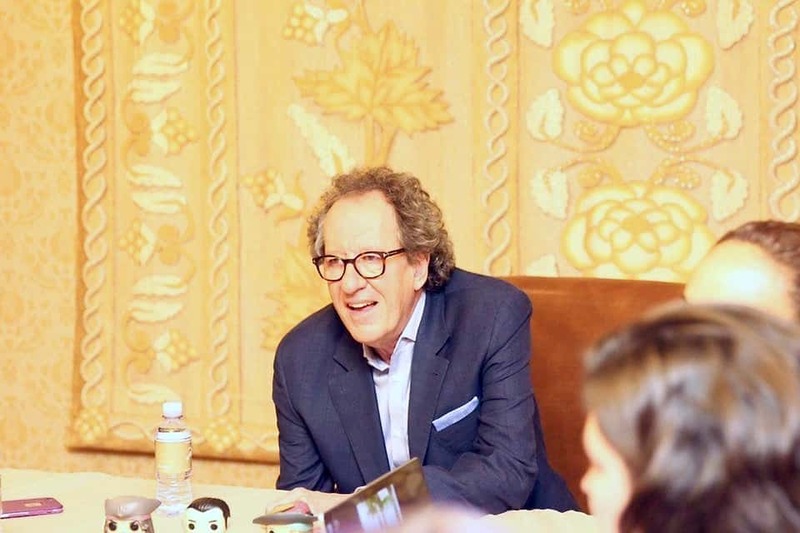 What a great opportunity to interview Geoffrey Rush who is a wonderful actor. Looking forward to the new movie. This is a big opportunity great interview! Looks like you had a super fun time. Your post is amazing. Mr. Rush sounds wonderful. Your post got me excited for the new movie. This is amazing. Mr. Rush sounds such a nice man. Your post got me excited for the new movie. What a great chance to meet and interview this man! We’ve been binge-watching all the older Pirates of the Carribean films preparing for this newest one. Can’t wait to see it! What an awesome chance to get to know the character and actor better! It’s an awesome interview, I like this passion for his work. I think this is great. I’ve always liked his acting and I can’t wait to watch him in the movie. I’m sure they all did amazing. Wow, that is a great experience! I wish I can attend that kind of event too! I love hearing from the actors before I see a film. It truly enhances my viewing experience. Great job! This is so cool! I think it’s awesome that you were able to meet and interview him. Wow, what a great experience. I bet you enjoyed every second. I hope you will be able to interview other people you admire as well. I just saw the movie last night and was curious to know what you thought of the movie in general. I agree that the relationship with Barbosa is a lot of fun. It’s part of what made the series so successful for all this time. Wow! What a treat it must have been to sit down with him! I love the pirates franchise. What talent! Wow! What an amazing opportunity! Go you. I am so excited for this movie! This seems like an awesome opportunity and looks like it is going to be an exciting movie coming up. It,it’s have been a fun thing to attend. Awesome !! What a great interview. You learn so much about a person and their life. Wow!, You are so lucky! I like this man and his character. Ugh, I can’t wait to watch the Pirates of the Caribbean!